This competition in the Bahamas has produced incredible results across the board and I think there are very important lessons to be learned here. Quite apart from the physical conditions of comparatively warm, deep and current-less water, without much surface disturbance, there are other very important factors at work here. Just a few words about what was perhaps the greatest dive in history . Alexey Molchanov declared 128 CWT –what happened is another story ,in fact he descended to 129.7 mts ,Effectively 130 mts , he could’nt find the tag – Why ? there are several reasons – narcosis is part of the story . One gets very stoned at this depth .Alexey however breathes up on the surface in a vertical position and is a moderate packer,so probably at the end of packing he does not have much more air in his lungs than if he had breathed up on his back and taken one giant breath before diving. 1 the plate does not seem to have been illuminated . if this is indeed the case ,somebody was seriously stupid. In spite of all this Alkexey returned to the surface and completed a clean protocol . What can this man do ? he has elevated freediving and the human potential to the level of the super human ! This dive ,a very short time ago would have been achievable by only 2 or 3 people in the world in No Limits !! And none of them could have spent 14 seconds on the bottom !! The Cortez Cup Challenge was conceived to give my students a chance to experience competition , to make marks and break Mexican National records. 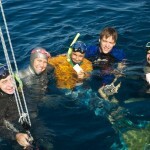 In this we had a resounding success 6 National records broken by 3 of the Freediver’s Students . There were no Blackouts and no disqualifications in this competition . In my estimation we had a narrow window of opportunity before the Northerly winds and winter water temperatures put an end to our aspirations till the summer of 2011. One of the problems we faced was lack of personal equipment by all the students .Only Estrella and Gonzalo had equipment , Estrella had an excellent monofin a very good suit provided by her sponsors Costa Baja. Liquid goggles, neck weight, weight belt and nose clip were provided by her trainer, Aharon. Gonzalo had complete equipment, but Esteban had only a suit so was limited to doing dynamic no fins in the pool and Free Immersion and Constant Weight no Fins in the sea . 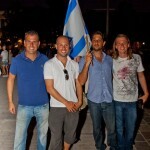 Aharon is teaching advanced courses in Eilat, Israel in December. either by equlisation problems, or pressure problems, or mental/psychological difficulties . No special fitness level necessary to pass this very common barrier. After this comes the freedom and a real chance to enjoy deep diving, and explore your potential. Advice will be given on how to prepare during this winter for a summer of great achievements. 12 th 13 th 14 th are sea days. The competition winner will be decided on the basis of 2 results at sea and 1 pool event of your choice . I am more and more frequently asked questions about lung squeeze. For some reason, incidences of lung/trachea squeeze seem to be getting more frequent . This can be frightening if it is not better understood. Most of the “lung” squeezes, are in fact, micro tares of the small blood vessels in the Trachea . It�s a long way from Mexico to Eilat. I was traveling with a very efficient and portable counter weight system. On arrival in Heathrow, I was informed it was �temporarily� mislaid. It later, 4 days later, re-incarnated as a cork screw, horribly deformed. Freedivers are teching three advanced courses in the Red Sea in Eilat, Israel in July. The minimum prerequisite for those wishing to attend is 40m CTW. The objective of the course is to teach all the advanced techniques for the competitive freediver to demonstrate how depth can be achieved and obstacles overcome. And to arrive at a logical incremental realisable program for your personal development. places are extremely limited. Book now! -First course 9-13 July – 1 place available. -Fourth course 29 July – 2 August – 4 places available. > Full cheek fill , not many people do this correctly , When ,where , how. > Training for depth Variable weight training and tables to increase depth. > Static at depth pros and cons . > How to increase your resistance to cold . The month was mainly spent in training four divers with different objectives, in different disciplines, for different competitions. As you see – a lot of differences, but I hope this will become clearer as the story is told. The deepest diver was MT. Maria Teresa was preparing for the 3rd Mediterranean Cup in Greece, and then on to Okinawa 2010 in Japan with the UK team. Her style with a monofin is excellent, rythm and pace were right, her breath hold was on target, her static, which is not her favourite occupation, was in the 6 min range. Her challenges were regularity. The demands of work and courses were the problem here and when there were consequetive days, sometimes the weather didn’t like us and there was always the third day tiredness factor, which we have always attributed to 2 factors – Nitric Oxide depletion and phsycological exhaustion. More is not always better! Rest is the most often ignored facet of training and it is vital, together with hydration. However, her progression in depth was going exactly to schedule, the progression was systematic in small realisable units of 1 or maximum 2 mts. Each time the equalisation at the bottom was achieved -just ! She had put in a lot of work on mental training, normally people resort to this when there is already a problem. The correct approach is that it should be an integral part of the training from the begining, its initially being able to give yourself a command before the dive and then being able to execute it at the right time in the dive. In the case of a beginner it might be “I must not look down on descent”, this is the begining of mental training, later it becomes taking control of the mind which involves knowing what commands to give and how to “frame” them. Later with the advanced diver (more than 60mts), when a lot has already been transferred to the automatic pilot and rythm of equalisation, timing of cheek fill, and entry into the glide are all automatic, then the art becomes one of finding the right focus, which passes from the needle point focus to the dispersed all encompassing focus, where everything just happens by itself without conscious effort. It is the Zen of diving. Alina achieved this in her Israeli record dive of 38mts. Only 38mts! it could have been quite a bit more but the limitation was mine as this was her first competition and we wanted to get it right as she said it could have been an easy 40mt+. Alina has excellent monofin style and impressive will power. For the 40mt diver one of the challenges is avoiding pressure “set points” ,every good trainer is familiar with this, it can even happen between 20-30 mts the diver descends without a depth guage on an unmarked line and stops at exactly the same depth every time. What is happening is the mind is confusing a feeling of pressure and the sensation of running out of air. The solution is first asking the diver to test if during the ascent the feeling of out of air persists or dissappears. In the advanced diver, more “empty lung” work is reccommended and later tables of head down descents in variable weights. Alina pre-empted this trap. With Estrella – whose main discipline is no fins, the focus is, at first, on minute alterations of style to eliminate drag and maximise movement and to know exactly what amount of glide between each movement at what depth. She was a competition swimmer and has the physiological advantages of height and the build of an athelete that was formed at a very early age. Her understanding of style and how to adapt it for the under water is quick and intelligent. In her first week of training she passed the 4 min mark in static. Her challenge was in agreeing to the idea of systematic, incremental progress. She had a degree of impatience to explore the limits of her considerable potential, the trouble with this is you discover your limits, and they tend to become limits. So time with Estrella is spent in counting movements to a certain depth and timing the distance covered. Discipline! The group is completed by Manolo who is training for the Mexican National record in Static, he currently holds the male CNF and DNF records. He has an instinctive understanding of the axiom “you need stress to produce results, but stress does not produce results, adaptation to stress – does”. In here is the golden mean the right amount of stress and Manolo has an instinctive feeling for this. It was a great group and I learnt a lot working with them . Next we will be telling you about the competition the Cortez Challenge. Maria Teresa preparing for the Mediterranean World Cup in Greece and The International competition in Okinawa , Alina Tsivkin�s preparation of 3 Israeli Records in CWT , FIM and DYN, and Estrella Navarro�s preparation of Mexican records in CNF, DNF and FIM. And finally the Spring Cortez Cup challenge. This was a particularly nice group and very unlike most spearos . The basic trouble teaching spearos is because they are always vastly over weighted and are used to riding their weights to the bottom they have no idea of technique or even an idea that it might benefit them . They cant do a duck dive, their finning looks a lot like someone trying to ride a bicycle in a very tight miniskirt and believe it or not some have a lot of trouble equalising in a head down position . They all look down at the bottom when descending ,not realising that it is impossible to kick properly in this position – 80% back kick and 20% forward ,that it complicates equalisation and is in fact dangerous- incomplete irrigation of the brain. Most of them have no idea of safety or of the dangers of their ignorance of this subject . My conclusion is that it is a miracle that any of them are still alive !! The main reason being that the majority are not 100ft men but fish in 6-7 mts. The contrast between them and their brothers in the Mediterranean is stark . In the Med . There are no fish worth taking between 30mts and the surface . The Mediterranean fishermen have long ago learned the benefits of adopting classic freedive techniques and learning a lot more about safety. their aquacity where they are squandering all their gains in breath hold . All they hear is bla bla bla BREATH HOLD bla bla bla . This group was exceptional in every respect ,especially in their lack of student deafness and their willingness to learn. Giammarco is the owner of the best restaurant in Cabo San Lucas ,the Sunset Monalisa , it is both superbly situated facing the famous arch across the bay and has the informal quiet elegance of Italy. Salvatore is the commander in chief of the kitchen and Carlos ,a professional photographer, is their fishing buddy . They came with the expected fishermen�s faults but there the parallel stops , they learned and very fast .Their style improved ,both kicking and duck dive , as did head position and equalisation . Their static breathold went to 4 mins and their dynamic and breath walk doubled . Breath walks of 1 min static and the 1:50 still holding were performed . But the spirit of the group was inspiring in spite of some unusual hardships . Once getting chased out of the water by Humbolt squid ( see my former blog )and having to deal on more than one occasion with horrendous currents .All this paid off with DEPTH and more fish and I hope a much better understanding of safety. My next blog will be following the trials and tribulations of a group of Elite freedivers their challenges and their training.The Mental aspects ,their progression in training , the questions that came up and the solutions we found together. And then of course our Mini competition where a number of National records of 2 nations were broken . One of those rare spring mornings with a perfect calm, a sea of burnished silver. Ideal conditions for spotting whale sharks on the surface. We decided to see if we could find one as MT had been complaining that she was the only person left in La Paz who had not filmed or ridden a whale shark. It was an official rest day, we had just begun depth training and this would have been the 4th consecutive day, something we try not to do. (Nitric oxide depletion and psychological stress). It was the very beginning of training and although the depths were not great 50+mts, multiple descents both CTW and FIM in a session take their toll. Alina had already done an unofficial Israeli female record in training ,38.5 mts and was on her way to 40+mts. 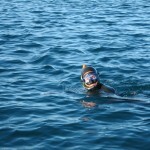 In shallow water 20 mins after leaving the port we saw in the distance an extraordinary sight. 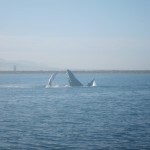 Whales breaching and eye hopping. I quickly identified them as Humpbacks from the acrobatics, but there was something unusual at first it looked like a spout that hung much too long in the air (or like sails ?). 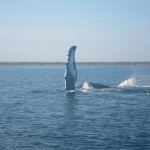 There we are, humpbacks had taken up sailing !! As we got nearer – the answer became apparent they were swimming on their backs and� what we were seeing was the early sunlight flashing of the white underside of their giant pectoral fins . They were swimming on their backs and rolling together in a beautiful dance, this looked to our untutored eye like a mating behavior but perhaps they were just enjoying the morning. We followed them for a while but not wanting to push them, broke off the encounter, and shortly thereafter we spotted a large fin not 20mts from the boat and MT had her whale shark. This is definitely a first for us! We have been teaching free diving since 1994, and we have never had to cancel a course, the hurricanes have been kind to us and we have never lost more than a day to bad weather and that covers Eilat ,The Turks and Caicos ,Greece and Mexico! But to be chased out of the water by Giant Squid !!! In the Turks and Caicos we have had sharks following us up and down the line and never missed a beat , but this was a different ball game . We had had some experience with these predators before in 2005 when we nearly lost Armando Torres, the president and founder of AIDA Mexico to two of them that adhered to him while safety diving for Luis Turrent. 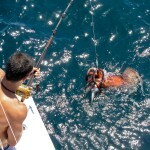 This until now had been a very good course, 3 spear fishermen from Cabo San Lucas. There had been initially some issues with equalisation, the usual syndrome, particularly tenacious in spearos�looking down the line. Other elements had progressed well, the course had been on two weekends with two weeks in between. 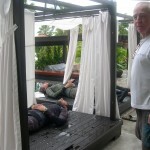 I had given them one simple but very special breathing exercise and the breath walk. On first attempt they had achieved 4:00 mins static each and 75 mts dynamic in long bi fins. Their original marks had been from 1:50 -2:20 static and 25 mts dynamic . One had reached 1:52 after a 1 min static in breath walk and the rest not far behind. As was usual their main challenge was finning technique. This is the hardest thing of all to change in spearos. They are used to descending effortlessly with a ton of weights and a very rapid ascent to the surface. Might work for 7-10mts but not safely for 30 mts !! First you have to convince them, then undo their bad habits, then teach them. There are obstacles at each stage. But here we were ready to do drops (variable head down) For inurement to pressure and being able to separate the feeling of squeeze from �help I am running out of air �.We were over 80+mts of water in case MT and I got a chance to drop . We were nearly dressed when our skipper pointed out that in a boat 50mts from us there was some strange action . It became immediately apparent that they were hauling in Giants 3 and 4 at a time !! So we immediately gave up on the idea of diving , we were in an invasion !! On the intercom they had ordered swimmers from the beaches out of the water. So we began to fish them too !�One was actually gaffed when one of his brothers came and swallowed him up to the head . We intend to report on our courses week by week and the issues that come up in them and how. we deal with them and also in the training and development of elite athletes training with us . So keep an eye on this blog . Improve your ventilation and Breath-Hold NOW! You�ve invested in all the right gear but if you want to be prepared for the upcoming dive season, learn to stay down effortlessly for longer and safely this course is for YOU! 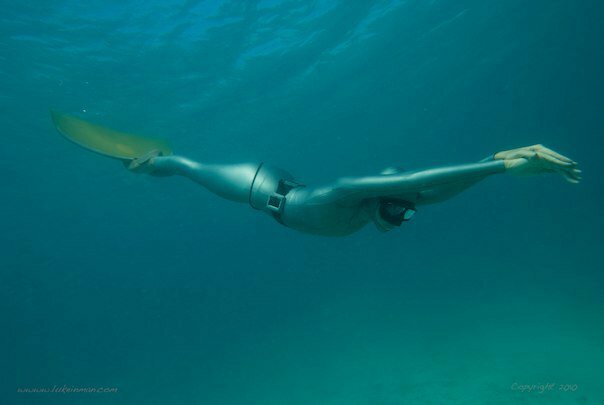 �FREEDIVERS� Aharon Solomons and MT have worked with Oxford University, and co-operated with tests for the University of Stockholm and have trained elite world and national freedive record holders and spearfishermen since 1992. They are both highly qualified AIDA Master Instructors and compete at world class level. Aharon is current US Masters freedive champion in 3 disciplines and MT is to be twice UK national team member in the World Freedive Championships, with personal bests in Static breath-hold of 6:00 minutes and 220ft, (72m) in Constant Weight. What do you leave with? You get to set your own efficient dry and wet breath-hold training program and the assurance of improved personal in-water safety. You get to return home ALIVE! THE BEST IN BREATH-HOLD TRAINING! Here you will find our lastest news, notices and events.